First time in Vadodara! 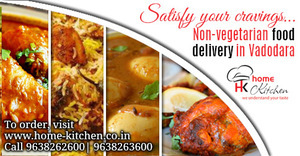 Home-Kitchen.co.in serves Non-vegetarian food delivery in Vadodara which is freshly cooked at home and is delivered right at your doorsteps. We serve with a wide range of Egg and Chicken delicacies, Egg Biryani and many more. The food cooked is healthy and has a unique authentic taste.